The exchange rate is favourable for all Western travellers in Estonia, making the presence of a kitchen for prepping your own meals in the hostel quite unnecessary. But what’s the food like? There are plenty of places around town offering traditional Estonian food - there’s a lot of meat, especially pork, and potatoes involved, not surprisingly (I saw through a window of one restaurant people sitting down to a plate of shank the size of a log). Soups feature, as does fish, such as salmon. Although Tallinn is only on the cusp of mega-tourism, there are a lot of restaurants plying the cashed-up tourist trade, with waiters in costume, offering ‘traditional medieval banquets’. Not my scene. 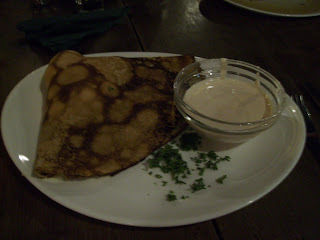 I ate three times at Kompressor, on Rataskaevu. It’s one room, filled with large, sturdy, round wooden tables, and feels like a bit of a student haunt. There were always lots of locals. It’s known for its pancakes, which cost between EEK40-50 (about €3). I sampled the smoked chicken and fetta, which came with a sauce that would have sat well with a prawn cocktail!. It perhaps wasn’t the greatest example, the fetta being relegated to one ‘corner’, and predictably the last one I ate, but it’s great value for money. I was better served by their soups. First up I had sjetlana, a Russian meat soup (a quick google search came up with this recipe, in Estonian!) It came with a very tomatoey, spiced broth, covering diced sausage, olives, onion, celery, gherkin, lime and with sour cream (a ubiquitous Estonian ingredient) squirted on top. The olives didn’t really work - everything else was a much more sour taste and they were far too salty and, well, mediterranean. 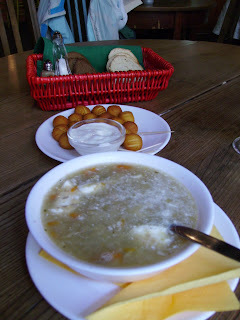 I was happier with the sauerkraut soup (again, note ever-present sour cream). I ordered this with the fried potato balls with garlic sauce that I’d noticed on previous visits. Given the soup came, as always, with both white and rye bread, it was way more food than I could have eaten, and I was already pitying the person who would be sitting next to me on a plane in a few hours! 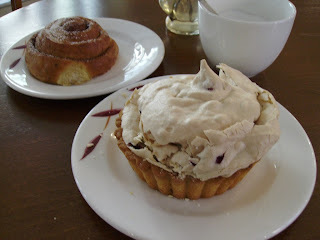 The day of pastry: On my third day in Estonia I went to Parnu, on the coast, breakfasting first in Tallinn at Cafe Matilda on Lühike Jalg. Just look at what I ate and tell me you don’t want one right now! This was a pohla besee korv. It’s a tart base, layered with raspberry jam, then filled with blueberry, gooey meringue, almonds and redcurrants, then with the hard meringue shell on top. It was sweet, hearty, filling and felt entirely appropriate to start the day! 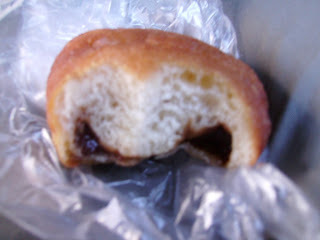 The kiraleesai, or cinnamon scroll, I held over for lunch. Afternoon tea was a moosi pall, near enough to a jam doughnut. By dinner I felt the distinct need to rectify my exclusively pastry-based diet, and hit upon grilled pork with baked mushroom, onion and pepper mix, at Karja Kelder, reputedly Tallinn’s oldest pub. 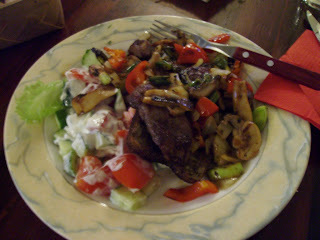 Sour cream on the salad, of course, but lots of well treated meat with fresh and crisp vegies. And it cost about €3.50. Far more than the food though, what I loved in Estonia was the pear cider. Has anyone come across it in Australia? Saku Kiss was the most common brand over there, but I doubt it would be exported much. Thanks for the feedback! I'm having fond memories of those pastries and pancakes :) And I'd forgotten about the last comment in the post - in the last year or so pear cider has become wildly fashionable over here. You can hardly go out without seeing it on tap.